Tool to convert BUP file extracted with SwpExt to BMP. fixOcclusion is a simple drag-and-drop utility based on some of the functionality from the earlier pidRewrite tool. Its purpose is to fix the occlusion settings in early v130 pid's (basically, the ones from Build 55) so that they are fuly compatible with later ones and can be properly viewed in TresEd. Just place the executable in the same folder as the Build 55 *.PID files, then drag an drop on top of it each .PID file you want to convert. The original ones will be saved with a ".bak" extension, just in case. Tool to add models into Trespasser levels. Tool to extract Trespasser geometry to .3ds files. Pid reWrite is a simple drag-and-drop utility to convert early v120 pid's into v130 (for TresEd viewing). See the text file that is included for how to use. Creates new level files for Trespasser, essential for modders. Also doubles as a pid editor and pid/swap generator, creating an empty set of these files to do a complete swap update. Help files and quick start guide included. The process is easy, but you do need to follow the steps correctly. SWP file texture replacement tool. Obsolete: Use GeomAdd to replace textures. SWP file texture extraction tool. Obsolete: Use TresEd or GUIApp CE Edition to extract textures. Utility to compress and decompress Trespasser texture files (.SWP and .SPZ). Copies T-Script values for a numbered array of objects. Further instructions included. Loads tpa files for easy listening. Program allows you to save, play, or add new sounds (.cau files) to existing tpa files, or to create new tpa files. Also displays any captions that are assigned to an entry. Due note, if found inside directory, do not use the blank .tpa file found inside program directory (will not work), create any new .tpa file needed from the tpa_reader itself. TPA Player is a TPA player that allows the user to play TPA files and .cau files. The latest version allows you to play any TPA's between Build 22 (E3 Demo) to the release. Program is an installer package, and there is is a short read_me file which you can find inside the program's folder." Experimental utility to add new sounds to TPA (Trespasser Audio) files. Tool to extract sound files from TPA files. This is a small program that updates the old version (v130 and v140) TPA files contained in earlier Trespasser builds, like Build 22 (E3 demo), Build 32 (PC Gamer demo) and Build 55, making a new version (v150) compatible with the engine from the Trespasser release (Builds 116 and 117). Just place the executable in the same folder as the old TPA files, then drag and drop each file you want to convert on top of it. A new file with the same name will be created, and the old file will be renamed with the extension ".bak" at the end. The process may take a while when updating the Stream.tpa files, just be patient. A DOS window will open and display messages concerning the update's progress; press the "Enter" key upon finishing so that it closes. The source code for the program is included too, in case you want to learn how it works. Displays caption data (if it exists), listen to packed wav files inside of retail and demo tpas Loads tpa files for easy listening. Program allows you to save, play, or add new sounds (.cau files) to existing tpa files, or to create new tpa files. Also displays any captions that are assigned to an entry. Due note, if found inside directory, do not use the blank .tpa file found inside program directory (will not work), create any new .tpa file needed from the tpa_reader itself. 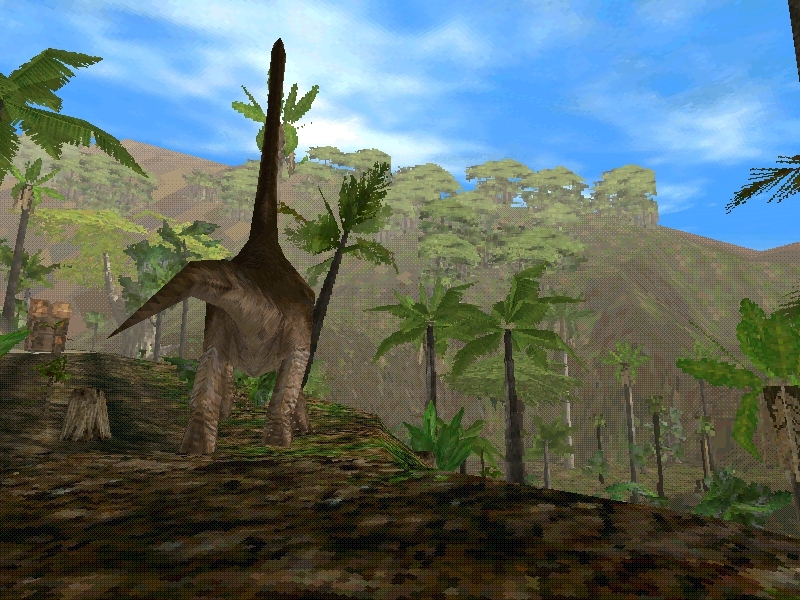 "Trespasser Dinosaur Creator", easy to handle application to turn static models into dinosaurs v0.2.7 (get the latest updates from the author's site). Runtime Libraries for TPDC. You do not need these files to run TPDC unless the operating system complains about missing libraries. If you are running Windows Vista/Windows 7, copy these files to the "system" directory. If you are running Windows XP/2000, place these files in "c:windowssystem32". If you are running Windows 95/98 or then you can put them in "c:windows" or "c:windowssystem". Do NOT overwrite any files if Windows asks you to. Trespasser benchmark tool, shows frame rate (FPS) in-game. Tool to create .values files for new models. Read the readme for instructions. Contains GUIApp, GroffBuild and EffectsEditor with modern OS support. Adds DirectX 9 support for GUIApp and some other useful modifications for modders. CRC tool (recursive and non-recursive versions), it has two main sections: a CRC-32 calculator, whose purpose is to calculate the CRC-32 hash for any string entered, as Trespasser internally does; and a CRC-32 reversing section, whose purpose is to help finding a valid string that matches a known CRC-32 hash, and can be used to access any unused sounds or textures inside the Trespasser retail files. You can guess the beginning and/or the ending of the string, and the app will find a 4-character or longer sequence which together with them will give the desired CRC-32 value. There are two versions released together, the even-numbered one (24) is implemented using recursion, while the odd-numbered one (25) doesn't use recursion, and is a little slower. Source code is included. Additionally, I've made experimental versions that calculate the string in backwards sense, but aside from some purely experimental use, there's no reason to use them instead of the regular ones. Trespasser Millennium is an updated version of the modding suite Trespasser Twilight, released for Trespasser's 20th Anniversary. All you need in order to create your own Trespasser levels! Trespasser Twilight, a new utility package for all Trespasser modders out there, or people who just play the game. So what is the difference between Trespasser Twilight and Trespasser Custom Edition (not to be confused with the CE patch) you may ask? CE was created over two years ago, and is today outdated. Trespasser Twilight brings you the latest tools available on the Trespasser market (NOTE: by December 2010! ), and that’s not all! It brings a whole new look to everything. My advice for you is to check it out as soon as possible, you will be surprised. This package already contains the two patches and the extra player models pack. Made for Trespasser's 10th anniversary, Custom Edition is a repack of the demo engine, featuring a completely new menu design, new sounds, new loading screens, new icons, resources, and all the commonly used editing tools; all arranged into an orderly file structure, to make editing easier and more streamlined. Obsolete: Use Trespasser Twilight instead. WavPac_Player is a simple program to store wave files. The most common types of wave files within storage (packed inside WavPacFile (.wpf) can also be played within the program. The wav files stored can be exported as a single wave file, or in mass. I want to try to create new levels, but I dont understand what to get to do that. I also do not have any unzip program for rar files. can you put zip files up for those? I would also like to find out if it is possible to get the lost levels and if they can be made playable at all. I keep getting my screen flashing after I use tres ed, and I have to delete everything for it to stop.. any idea what the problem could be? I really want to learn how to do levels, so I can work on fixing them the way I think they should have been. Bryan, check the forums, you will find all the help you need there. As for the flashing – I have no idea. I’m aware that newer windows system vista, 7, 8 etc causes TresEd to act weird many times.